I wrote about motivic cell structures and the Białynicki-Birula decomposition before. Here I'll explain how to compute a motivic cell structure out of the BB-decomposition explicitly and how to get an explicit BB-decomposition for any smooth complete toric variety. Then I'll do the examples. As described in the last post about Białynicki-Birula's Annals paper from 1972/73, for a -action on a smooth complete variety over a (possibly non-closed) field (of arbitrary characteristics), there is the plus-decomposition, giving us for each fixed point a subscheme which is isomorphic to an affine space . The number is the dimension of the positive weight part (with respect to the induced -action) of the (co)tangent space of at . Here every is a proper inclusion. The proof uses Sumihiro's equivariant completion, which provides an equivariant closed immersion into a projective space with linear torus action, so there one can filter the projective space by the weights of this action and that provides the closed immersions. If one wants to compute something, one can of course figure out a good order of the fixed points by hand, without looking at equivariant embeddings at all. At the moment, I don't know any algorithm other than brute force to do that. Now we build a motivic cell structure out of this. This is slightly unusual, as the attaching maps arise "the other way around" than one would expect. If it confuses you, the examples below might provide illumination. The open subscheme has complement isomorphic to a disjoint union of some . to be a homotopy cofiber sequence. One more homotopy cofiber construction gives us , an attaching map of into that gives us, as next homotopy cofiber, the space . So this produces inductively a stable motivic cell structure on , since for a cofiber sequence with two stably cellular spaces, a theorem of Dugger and Isaksen shows that the third space is also stably cellular. That toric varieties have a motivic cell structure (without referring to the BB-decomposition) is already contained in the paper of Dugger and Isaksen Motivic Cell Structures. From a homotopy cofiber sequence we get a distinguished triangle in the category of motives of the reduced motives . Like with reduced and unreduces cohomology theories, , so we can compute motives of varieties from homotopy cofiber sequences. It is long known for toric varieties, that any torus cocharacter in general position (in the cocharacter lattice) has the same fixed points as the torus. To describe explicit cell decompositions, one needs to know which cocharacter is "in general position" and which cocharacter has a larger fixed point set. A cocharacter fixes an orbit if is inside the linear subspace generated by . The full torus has as fixed points those with of maximal dimension. To pick a good cocharacter, one just has to avoid the hyperplanes spanned by the codimension 1 cones in the fan. The fan of the projective line consists of the cone and the cones generated by and respectively. The affine variety corresponding to the -cone is and the affine variety corresponding to the -cone is . Their intersection is the affine variety corresponding to the cone , which is the torus . The torus acts on itself via the group multiplication, and it acts on and trivially, i.e. these are the fixed points of the action. If you prefer homogeneous coordinates, acts on as , so we have and . 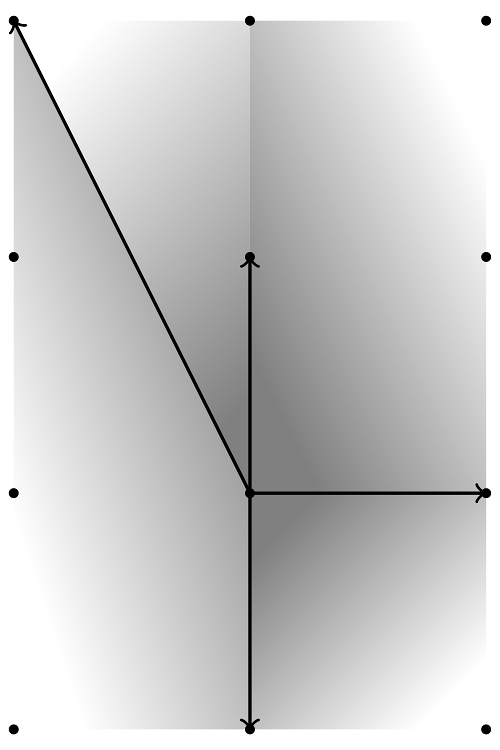 The Kähler differentials are and . The induced -action is and , respectively. We see that the positive weight part at is everything, while at it is nothing. Consequently, the orthogonal at is nothing and at it is everything. Under we get an isomorphic preimage of this orthogonal and take the ideal generated by it. This gives us ideals and . They correspond to the cells and . This is already the BB-decomposition: . The BB-filtration of is (with ) just . To get a motivic cell structure, we need attaching maps for the cell to the set of -cells . The stable attaching map is the cofibration , which one can see as the homotopy cofiber of , i.e. the gluing of along to a point . Now we have a splitting . Okay, that was kind of stupid, given that we already knew that is a -cell. It was also kind of stupid that we have computed a stable cell structure, while it is also quite easy to describe an unstable cell structure of projective spaces. We can also take a different -action on , by taking any cocharacter (i.e. group homomorphism) . These are all of the form for some . If , we get the same weight decomposition of (co)tangent spaces (Kähler differentials), hence the same BB-decomposition. If , we get no decomposition because the fixed points are not isolated (they are everything). If , we get the decomposition , which one might also call the minus-decomposition w.r.t. the first action considered. Here we have a torus acting and it becomes a slightly more interesting question which cocharacter gives which BB-decomposition. The fixed points of the torus are the orbit closures corresponding to the maximal cones, which are . Take the diagonal corresponding to the weight in the weight lattice. It doesn't hit any linear subspace generated by codimension one cones, so it has the same isolated fixed points, as the original torus. (In contrast, e.g. fixes a whole ). It is pretty obvious now how much influence the choice of a cocharacter has on the cell decomposition. There are only four different cell decompositions, corresponding to the four maximal-dimensional cones in the fan. This is also the motivic cell structure you would get as product cell structure from the previously considered cell structure for , and it is all parallel to classical topology, up to homotopy (though classically the gluing maps don't look that strange). and we get , since there are no non-trivial morphisms . The fixed points of the torus are , and (corresponding to the maximal dimensional cones in the fan, in counter-clockwise order). 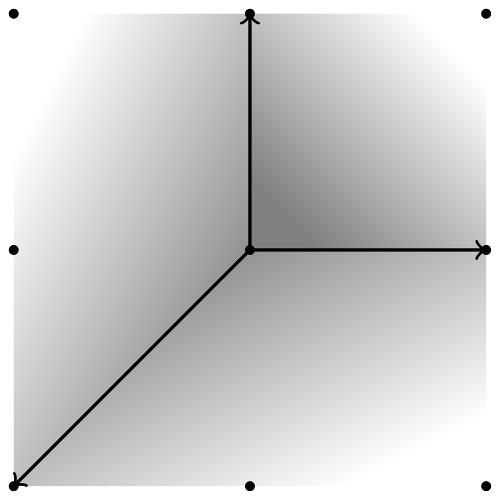 Denote by the affine toric variety corresponding to the maximal dimensional cone . 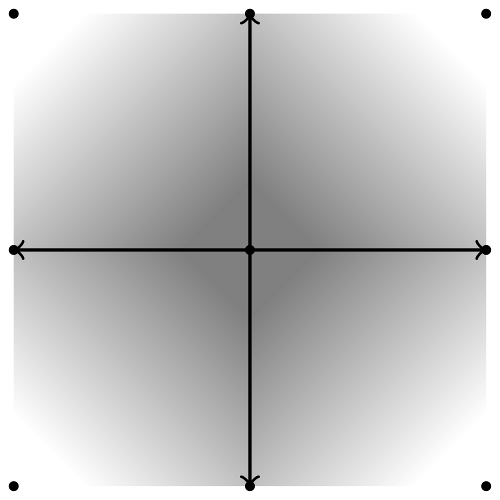 The diagonal cocharacter is no longer good, since lies in the linear subspace generated by a cone of the fan -- it fixes the projective line . This decomposition is one of the common decompositions of into and a at infinity, which is decomposed into and . The corresponding BB-filtration is just . As before, we have and . If we pick another cocharacter , this is still inside the cone , but it has a different scalar product with one of the rays, so the decomposition should be different. Indeed, from computations we find that the big cell now is part of and in we have only a -cell. The image shows the fan of . We pick the torus cocharacter of weight again, since it works for all Hirzebruch surfaces. The cone generated by and as well as the cone generated by and are just as in the situation of , and the corresponding affine toric varieties glue together to a , which is visible in the cell structure. The big cell is corresponding to the cone with faces and . The cone generated by and corresponds to a fixed point which is a BB-cell itself and the cone generated by and corresponds to a fixed point with attached BB-cell of dimension . The space is homotopy equivalent to the at the base, but the gluing map really depends on . The motive is just the same as the motive of . It is a well-known fact (and not hard to prove) that all complete nonsingular toric surfaces (implicitly assuming normal) are either , a Hirzebruch surface or a blow-up of one of these at torus fixed points, since one can describe such blow-ups with fans. One easily sees that blowing up a fixed point introduces an additional fixed point with "BB-cell" , therefore an additional to the motivic cell structure (the additional ). This introduces an additional to the motive.